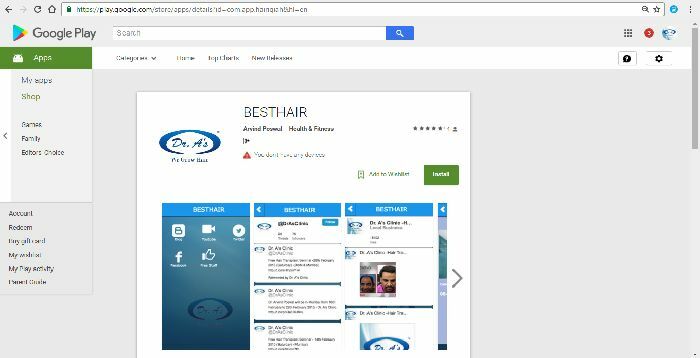 Dr. A’s clinic is happy to announce the launch of FREE ‘BESTHAIR’ phone app for smartphone users. Get in touch with the latest news, blogs, updates and discount offers on hair transplants. Open the Google Play Store app and type in search area “BESTHAIR”. Note: you can also go to play.google.com. Search or browse for content. Tap Install this app to Follow the screenshot below. What s the point in getting an app for hair transplant? What does the app offer that I cannot get from your website? Kind of irrelevant for hair transplant in my opinion. The only app I downloaded is for my boarding pass when I travel. Slowing down hairloss is very relevant to a person who has undergone a hair transplant, in my experience and in coming weeks I will be posting information regarding that on the app too. I will also be posting that info on hairsite for those not comfortable using an app.